Get a hawks’ eye view flying in a helicopter or fixed-wing light aircraft above the magnificent North Canterbury scenery. We have a range of flights available, or you can tailor your trip to suit! We can offer charter fixed wing and helicopter flights to anywhere in New Zealand! Hunting, fishing, skiing or sightseeing, we do it all. 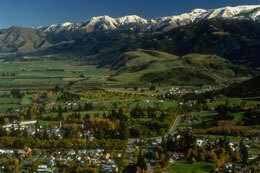 With our base in Hanmer Springs, we are ideally placed to fly you to remote hunting and fishing spots, unique scenery (including Kaikoura's most popular whale viewing) and upland ski areas. For hunting and fishing, we can supply experienced guides and quality equipment (subject to availability). Just contact our friendly staff and they will discuss your options for flights.